When I was a graduate chemistry student at UCSD, I toyed with the idea of working for Dr Stanley Miller. In his younger days, he had undertaken experiments looking into how the building blocks of life had first formed from the primordial soup prevalent on the early Earth. He and colleague Harold Urey collected various primordial chemicals together in large flasks and zapped them with electricity back in 1953 (1). Lo and behold, organic soup of a rather basic kind emerged, and his experiments were lauded across the world. But that was about as far as things went - further, more complex experiments over the next 30 years failed to take this 'evolution-in-a-test-tube' approach much further, and it became clear that the next stages of complex organic chemical formation were rather more complex than these initial successes had implied. As a result, I did not ask to study under Dr Miller, which was moot anyway as personal circumstances made me step back into the real world shortly afterwards! "The first is dubbed by Professor [Steven] Benner [of the Westheimer Institute for Science and Technology] as the 'tar paradox'. All living things are made of organic matter, but if you add energy such as heat or light to organic molecules and leave them to themselves, they don't create life. Instead, they turn into something more like tar, oil or asphalt. ""Certain elements seem able to control the propensity of organic materials to turn into tar, particularly boron and molybdenum, so we believe that minerals containing both were fundamental to life first starting," says Professor Benner. "Analysis of a Martian meteorite recently showed that there was boron on Mars; we now believe that the oxidized form of molybdenum was there too." "The second paradox is that life would have struggled to start on the early Earth because it was likely to have been totally covered by water. Not only would this have prevented sufficient concentrations of boron forming – it's currently only found in very dry places like Death Valley – but water is corrosive to RNA, which scientists believe was the first genetic molecule to appear. Although there was water on Mars, it covered much smaller areas than on early Earth. Apart from being rather fascinating in itself, there are two aspects to this that I'd like to highlight with respect to the early solar system. Firstly, that life may have emerged on another world, itself rocked by catastrophe sometime in its past. The concept of Panspermia seems to be gaining ground, as well as life's intimate connection with catastrophe. 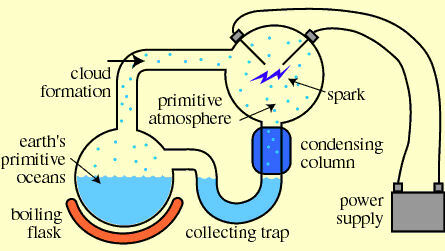 Secondly, that scientists think that the early Earth was probably completely covered in water. 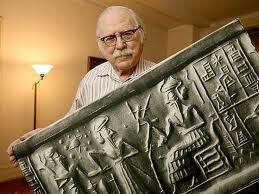 This is one of Zecharia Sitchin's claims for the early Earth, made back in 1976. He argued that the precursor to Earth was a watery world, which was associated with the mythical monster Tiamat by the Babylonians. That world, initially located between Mars and Jupiter, was pummelled by one of the moons of the rogue planet Marduk (my Dark Star) during an early incursion through the solar system. 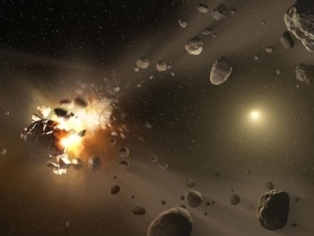 The resultant catastrophe shifted a much-diminished Earth into an orbit closer to the Sun, and rendered what debris remained as the Asteroid Belt. It would appear that Earth's early status as a watery world has now been confirmed! Author Steve Pearse sent me a copy of his book 'Set Your Phaser to Stun' to review. 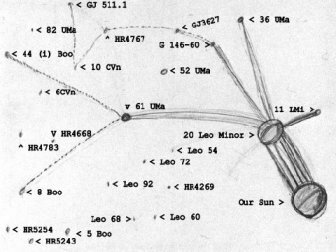 It's full of astronomical information and technical data about the stars in our solar neighbourhood, and highlights his analysis of the correct positioning of the star map drawn by abductee Betty Hill. Anyone who wants to read an in-depth discussion of the book itself can refer to my review. Despite many problems I encountered with the way the book had been written and presented, at the core of the book was a pretty solid piece of research. Pearse's critique of Marjorie Fish's analysis was very strong. The data which she had relied upon to build her 3D model of the solar stellar neighbourhood had changed substantially since the 1970s, as more powerful telescopes had come online in the Southern Hemisphere. This meant that her map was now distorted to the point where it no longer works. Additionally, it is now recognised by scientists that for stars to produce useful, potentially life-supporting planets they need to have a certain degree of 'metallicity'. That is, the elemental composition of the star heavier than mere hydrogen and helium must reach a certain threshold to allow life-supporting rocky planets to form in their proto-planetary disks. The problem for the Fish model is that her favoured stars, Zeta Reticuli 1 and 2 (which are older, Sun-like stars) are now understood to have very poor metallicities. As a result, it is unlikely that they will be found to harbour habitable worlds in their systems. Now, that's not cast in stone, but taken in conjunction with the positional changes of the neighbourhood stars in astrometric charts, the case for Zeta Reticuli seems increasingly problematic. Steve Pearse argues that many of the well-known researchers associated with the Hill Abduction case should be aware of these issues, yet they continue to adhere to the Fish model as proof of the reality of the abduction event. He offers a new solution which has its merits (right), although I think it's fair to say that the case is really blown wide open. Still, his arguments seem strong enough to contemplate a new world for those pesky ETs, the Greys. "Until now, the chronology of the earliest days of Egypt has been based on rough estimates. With no written records from this very early period, a timeline has been based on the evolving styles of ceramics unearthed from human burial sites. For Egyptologists, this presents new problems, because the gap between the initial inhabitation of Egypt - by groups who farmed the land along the Nile - as indicated by this scientific work, and the acknowledged dates for the unification of Egypt is really rather short; at just several hundred years. By comparison, a similar evolution from agriculture to civilisation occurred over a much longer time period in Mesopotamia. So why was there such an accelerated race to civilisation in Egypt during this period? In the case of Egypt, does this argument also apply to the settling and emergence of agriculture along the river Nile, leading to a speedy development towards the high civilisation of the first Egyptian Dynasties? It would make sense, perhaps adding further credibility to the concept that something remarkable occurred around 3750BCE. The IRAS satellite infrared telescope team found Planet X / Nibiru in 1983. They announced it 6 times in the mainstream press, the last time on Jan 30, 1983 in an interview of an IRAS team astronomer, Ray Reynolds, of the Ames Research Center who said, "Astronomers are so sure of the 10th planet that they think that there is nothing left but to name it." The NASA "official" version is that no planet was found, a lie, and the shades were pulled down. 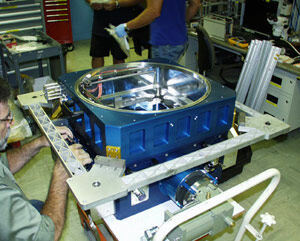 Since then astronomers have been intimidated by funding fright and will not say anything. Harrington, by that time, had the Pioneer, IRAS, data and findings, the evidence from visual "residuals", (observations of deviations in the orbits of the large planets indicating gravitational pull from another large planet), and the positive results of computer simulations. Note that, in the conference with Zecharia, Harrington says that he was confident --- in the early nineties --- that it "....is a nice, good planet, with an atmosphere in which we could be comfortable". That level of information and detail negates any question as to existence of planet Nibiru...........as shown clearly and unequivocally on a huge blow-up of a 4500 year old cylinder seal printout, VA/243, held by Zecharia showing our Sun with all the ten planets in their proper size and location around it, Sumerian (right). People who are into this topic should do their homework in depth. David Morrison and those in NASA (under military control) who are charged with maintaining the disinformation, must go laughing all the way to their offices when they see the speculation about a twin to our Sun, or brown, red, green, purple, dwarf, whatever, repeated once again. It's doing their job for them. Why the cover-up? Because it is related to the other two major cover-ups as detailed in the attached Declaration of Cosmic Humanity. All three are inextricably interrelated. Mention any one and the other two are brought into question. And the PTB, Vatican, Pentigon (sic) don't want that. Let's get passed (sic) this speculation, Nibiru has been disclosed, let's focus on protecting ourselves against it's potential devastating effects on the Earth and our species when it orbits into the inner solar system as a member of the system. Depending on Earth's position relative to it when it comes in, the effects can be milder or catastrophic. See: Allan and Delair, Cataclysm! The PTB know all about it, will go into their underground cities to protect themselves and consider us "useless eaters" (Kissinger). And it's on the way in, early effects are Earth changes and Climate changes: global warming/cooling, CO2 emissions, are symptoms not causes. I can't apologize for sounding a bit harsh and impatient here: things are getting close and we need to look out for ourselves and the rest of the planet." I wrote back to Mr Freer to highlight the fact that the 1983 press releases which he spoke about mentioned a Jupiter-sized planet, which could just as easily be describing a sub-brown dwarf (which are actually smaller than Jupiter, due to a quirk in physics I explain in 'Dark Star'). I urged him to have an open mind about the nature of Nibiru, and what it might turn out to be. Astronomy and planetary science has made many new discoveries since the early nineties, many of which are pertinent to these issues. I'm sorry to say that he did not reply to me. It seems to me that the debate around Nibiru is becoming increasingly polarised. On the one hand are those who think it is an in-coming planet, spelling imminent doom for our world on a timetable that (like my pension date) just keeps getting rolled back year after year. 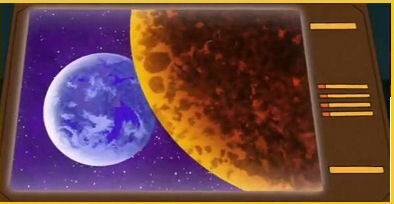 On the other, that Nibiru is a phenomenon connected to a more distance sub-brown dwarf object lying among the comets. As I noted last month on this blog, more researchers interested in this topic are advocating the existence of a brown dwarf companion as the more likely solution. There are good reasons for this, because without this potential heat source the claim made above by Mr Freer that Nibiru could still be a habitable world becomes very, very hard to justify. Well, that presumably means that these brown dwarf companions were captured (or perhaps formed independently from an orbiting or captured partial nebula later on, who knows?) But it's a pretty small sample range at just 4 such objects, so it might be a bit of a stretch to read too much into this at this stage. Also bear in mind that the kind of 'brown dwarf' I'm focussed on with my Dark Star Theory is some way down on the scale of these objects. So way down, in fact, that the Dark Star companion would really be a sub-brown dwarf, a cosmic entity which lies between the smallest brown dwarf and the gas giant Jupiter. Even so, could this mean that the Dark Star might have formed or been captured some time after the formation of the solar system? It most likely first made its presence felt 3.9 billion years ago during a period of time known as the 'late, heavy bombardment'. This was some 400 million years after the formation of the Sun, which more or less insinuates that any Dark Star out there should really have formed during the same time. Thanks to David for this. I kind of want to know what's in that briefcase now... More in next month's blog!